Editor’s note: Having just submitted a major grant on Friday and then having had to turn around and head to an NIH study section meeting today in Bethesda, I just didn’t have the time to produce something up to the usual standards of SBM for today. (And, being managing editor, I should know what’s up to the usual standards of SBM; what I started to write wasn’t it. Trust me on this.) Fortunately, Dr. Grant Ritchey and Dr. Steve Hendry, two skeptical, science-based dentists, did submit something up to SBM’s usual standards. Even better, since we’ve been having a number of requests for posts involving dentistry, it seemed like a perfect time to publish their first contribution to SBM and see how our readers like it. Maybe next time around, I’ll have them update the “state of knowledge” regarding amalgams. Form follows function, as the old saying goes. Nowhere in the human body is this adage more fitting than in the oral cavity. In less than two generations, the practice of dentistry has evolved from basic pain relief and function-based procedures (such as extractions and fillings), into today’s practices of complex cosmetic rehabilitation, orthopedic and orthodontic management of the teeth, jaws, and facial structures, replacing missing teeth with dental implants, and treatment of sleep apnea and temporomandibular joint (TMJ) disorders, to name but a few. With such rapid progress, it is to be expected that for every science based advance made in our field, there are just as many claims that are either dubious in their evidential support or outright pseudo-scientific or anti-scientific nonsense. In this article, we’ll be taking a look at the roles that health care practitioners such as chiropractors, osteopathic physicians, and physical therapists, are attempting to play in the dental field. We will also see how well-meaning dentists have been trained in and apply their pseudo-scientific principles in their dental practices. In particular, we’ll be examining Cranial Osteopathy (also known as Craniosacral Therapy or Cranial Therapy) in the management of the dental patient, the purported benefits claimed by practitioners of cranial osteopathy, and the quality and quantity of evidence for this type of treatment in the scientific literature. The human skull is made up of some eight cranial (head) bones and fourteen facial bones. These bones help protect the organs of vision, hearing, taste, equilibrium, and smell. They also provide attachment for muscles that move the head, control facial expressions and chew our food. At birth, the spaces between the cranial bones- called fontanelles – are wider and more elastic, allowing the infant to pass through the birth canal and later permitting brain growth in the first few years of life. In humans the lateral fontanelles close soon after birth, the posterior fontanelle generally closes several months later, and the anterior fontanelle may remain open for three years. 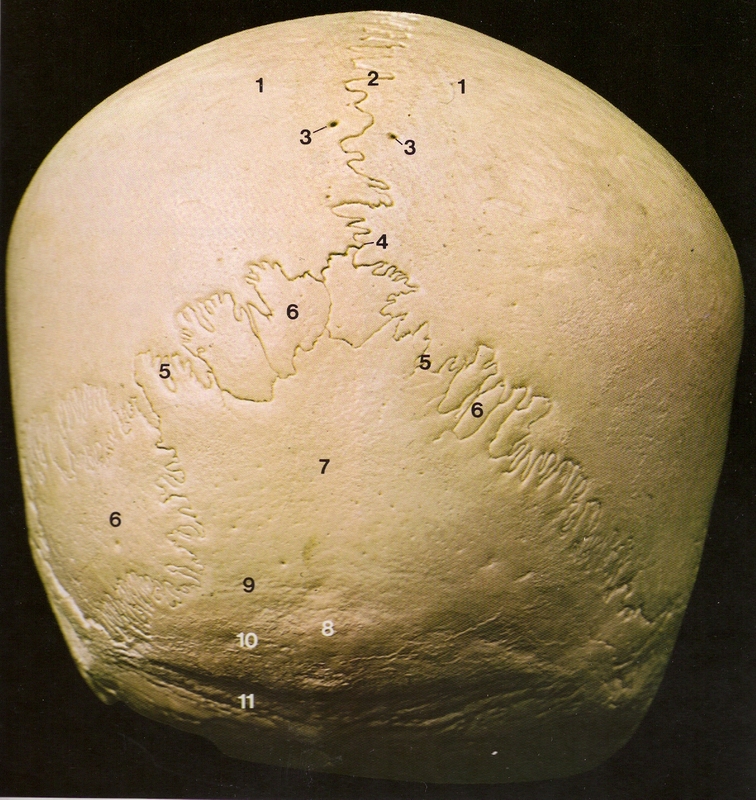 By early childhood, the cranial bones become tightly interlocked in a zig-zag, zipper like pattern (illustrated nicely here) that renders them immovable in a macroscopic sense, although each suture (called a synarthrosis if you want to impress your friends at parties) has a very slight amount of flexibility- 10-30 micrometers on average (1 micrometer = 1/1000th of a millimeter or approximately 4/100,000ths of an inch). These sutures fill the minuscule space between the cranial bones, essentially stitching them together with dense, strong connective tissue fibers called Sharpey’s fibers. Cranial Osteopathy was invented by William G. Sutherland D.O. around 1900 when, while viewing a disarticulated human skull, he noted the way some of the skull bones were: “…beveled… like the gills of a fish… indicating articular mobility… for a respiratory mechanism.” Note that we said “invented” rather than “discovered,” as this discipline was indeed invented from whole cloth, based upon the happenstance similarity in the appearance of a skull bone and the gills of a fish, which he then superimposed on his 19th century osteopathic ideology. (Imagine what he would have come up with had he instead noted the similarity between the uvula and the male genitalia!) Sutherland claimed, and adherents of Cranial Osteopathy hold, that the cerebrospinal fluid (CSF) has an inherent rhythmicity, which he likened to the tides of the ocean. He called this the “Primary Respiratory Mechanism (PRM)”, often referred to today as “Craniosacral Rhythms.” According to Osteopathic principles, the PRM underlies all of life’s processes and begets vitality, form, and substance to all of a person’s anatomy and physiological processes. Any disturbance in the natural flow of CSF could cause illness and conversely, practically any illness could be prevented or cured by the physical manipulation of the cranial bones, “freeing up” the functional flow of the CSF. Towards the latter part of his life, Sutherland believed that he could sense a “power” which allowed corrections to occur from inside his patients’ bodies without having to provide any physical manipulations. This has come to be known as “biodynamic craniosacral therapy” or “biodynamic osteopathy”. See this overview of the scope of Cranial Osteopathy (“The Cranial Concept”) in their own words. Of course, none of this imagery would be of any use without a therapy to sell, and osteopaths assert that they can fix what ails you through hands-on manipulation of your skull bones. As one practitioner’s website puts it: “As incredible as this may seem, we feel the bones move, the membranes pull, the fluids fluctuate, and even the brain undulate”. And woe unto the poor sap who suffers from a rigid-boned, lax-membraned, fluid stasisy, un-undulating brain! Practitioners of Craniosacral Therapy or Cranial Osteopathy claim that they can detect this secondary CSF pulse with simple palpation and distinguish them from a regular vascular pulse. Cranial manipulations are performed in a variety of different ways depending upon the condition being treated and the philosophy and training of the practitioner. (See an overview of some of the techniques.) Some of them include range of motion therapies similar to what a physical therapist would do; others involve the supposed manipulation and movement of the cranial bones, using only digital (i.e. finger) pressure with a very light force. Treatment is typically very gentle. Tissues are supported and allowed to change. Usually very little force is used during treatment, but at times some force may be necessary. Diagnosis and Treatment are said to blend into one another. As tissues change the physician learns more about their nature. As the nature of the tissue dysfunction is better understood, the therapeutic response deepens. Each patient’s experience is unique. Some patients sense only a gentle touch, while others feel their body change immediately. Some patients simply feel a deep sense of relaxation, and others feel nothing at all. Most patients feel a distinct change following the treatment. Though Cranial Osteopathy is very gentle, patients can occasionally experience some discomfort during certain stages of the treatment. When this occurs, it is simply a part of the healing process. As the treatment progresses, the discomfort subsides. Although physicians practicing Osteopathy in the Cranial Field will work anywhere on the body, they may find it important to diagnose and treat the head. Though styles of treatment may vary, the osteopathic physician will primarily focus on the body’s “mechanism” – the body’s natural striving for health and normal function. Cranial Osteopathy and its variants make a number of imaginative leaps from histological starting points to therapeutic endpoints. From the slight (micrometer) flexibility of cranial sutures, and the slight-but-measurable fluctuation in CSF pressures, practitioners infer that the brain and spinal cord undulate rhythmically “like a jelly fish, coiling and uncoiling” which is critical for health. Gradual movement of teeth within bones, and gradual orthopedic movement of facial bones themselves, are familiar to all dentists who do orthodontics. Dentists performing orthodontic treatment utilize various appliances to expand the palate (palatal sutures don’t normally fuse until adolescence) and move teeth within the jawbones. Further, the treatment of TMJ disorders has typically been in the realm of the dentist, involves the articulation of cranial bones in the scope of treatment (the mandible and the temporal bone), so the Osteopathy belief system would seem a natural fit to dentistry, especially in these areas. And sure enough, Osteopathy has colonized the dental profession. We’ve seen expensive dental continuing education courses with “Cranio-”, “Sacro Occipital Therapy” and “Chiro-” in their names that graft Osteopathic principles onto dentistry to create whole new, untapped disciplines to market. Websites promoting these dental applications of Cranial Osteopathy claim to teach amazing new skills to dentists, including how to “free up” and move facial bones around, by hand, in minutes using only fingertip pressure. Additionally, in almost every case, these dental courses provide a gateway to other, more garden variety forms of CAM: nutritional supplements, detox, immune system boosting, nervous system balancing, and so forth. For the dentist, taking one of these courses is the first step in going “down a rabbit hole” into CAM-land – a metaphor that devotees enthusiastically embrace and frequently use. An important point to reiterate here is that the emphasis in the dental application of cranial osteopathy is not merely to treat illness or facilitate the flow of the CSF as in “regular” osteopathy; it claims to actually bodily move the facial and cranial bones to more ideal positions to improve orthodontic and TMD outcomes. Cases are shown where overall changes in facial structure and the occlusion (i.e. the bite) are alleged to have been changed by as much as a half of an inch or more by cranial manipulation alone. Of course, these are case studies with little to no supplementary documentation (radiographs, CT scans, etc.) available for an objective reviewer to confirm the claims. We have yet to see a well-documented, objectively presented case study in the medical or dental literature which adequately demonstrates the validity of the treating practitioner’s claims, although one would think that after decades of the existence of their treatment modalities, such evidence would be plentiful, substantive, and readily accessible to the health care community. For Cranial Osteopathy to be viable treatment, there needs to be good evidence anatomically and histologically that the sutures are indeed movable (by hand, no less) to a significant degree, and evidence that doing so is therapeutically beneficial. Neither appears to exist. Although Cranial Osteopathy can provide a modicum of basic research to support its claims, it falls far short of what is needed to establish a scientific foothold in the dental-medical community. Osteopathic applications are woefully lacking in any substantive research but instead rely on anecdotal evidence as the foundation of its validity and applicability. See the excellent overview of Cranial Therapy at Quackwatch.org. Evaluating the literature, minute movements of the cranial bones appear to be possible (in the micrometer range as stated above) — but not the large rearrangements of bones that practitioners claim to make with hands-on manipulation. It is dubious that a practitioner can feel distortions in cranial bones that the most sensitive neurophysiological instruments cannot. Moreover, even if an Osteopathic therapist could detect abnormalities in the skull, there appears to be no credible evidence linking small movements at cranial sutures to beneficial health outcomes. As a scientific principle, this is nothing more than wishful thinking and resembles faith healing more than evidence based medicine. The therapeutic claims, research protocols, treatment goals, and definitions of what constitutes solid medical evidence are as flexible as the cranial bones they purport to manipulate. Cranial Osteopathic adherents predictably scold their critics as being closed-minded and unwilling to learn, or worse, a shill for the Dental Industrial Complex. But we like the old adage about staying open-minded, but not so open that your brain falls out. The really surprising (and disturbing) thing to us is the number of bright, conscientious, and highly-trained dentists we see being drawn to courses in Cranial Osteopathy, and in many cases buying into the smorgasbord of alternate-medicine courses offered as side dishes at the cranio-dental table. If there’s harm in the Cranio-dental movement, besides a lot of money wasted by dentists on dubious courses and by patients on dubious treatment, it may be that it seems to be a particularly attractive gateway to more bizarre alternate treatment philosophies – one that seems to appeal to surprisingly smart and educated dentists. By granting dentists a license to practice, the public trusts us to apply evidential knowledge to the management of their dental problems. This implies that we must critically examine new hypotheses, decide if there is rational evidence for them, reject the pseudo-science, and apply the knowledge that sifts through for the benefit of the patients we serve. Post Script: This is our first article in what we hope will be many to come on dental-related topics. We would love to hear from you, the fine readers of the Science Based Medicine Blog. If there are topics you would like to see addressed, or if you have any questions, comments, or critiques, please feel free to email us at HYPERLINK “mailto:[email protected]” [email protected]. Dr. Grant Ritchey received his Bachelor’s degree in Human Biology from the University of Kansas in 1982, and his Doctor of Dental Surgery degree from the University of Oklahoma in 1986. He lives in Kansas City, is married, and has two grown daughters. Since 1986, he has maintained a general dental practice in Tonganoxie, Kansas, and was awarded a Fellowship in the Academy of General Dentistry in 1998. Currently, he is working toward his Masters in Education Degree from the University at Buffalo in the Science and the Public program, with an emphasis on the prevalence of alternative medical practices in dentistry. Dr. Steve Hendry, BSc DDS FAGD, completed an honours degree in Genetics at the University of Western Ontario before deciding to be a dentist when he grew up. He spent summers working in a corn cytogenetics research lab through dental school. Since graduating in 1981, he’s maintained a general dental practice. Steve has always been fascinated and appalled at the scarcity of critical thinking skills in society and, increasingly in his own profession. He is particularly proud of having attained the status of “closed minded” in the eyes of some of his woo-friendly peers.